Early Thursday morning, the Evans family was taking their young puppy, MJ, for a walk when she suddenly disappeared. As they approached the spot where seconds ago MJ had been standing, whimpers echoed from a previously unnoticed sewer drain, which was hidden by the grass and missing its cap. At just a few weeks old, MJ had fallen into the hole and was quickly carried far from her family by water waste down the long pipe. It had only been a few days since the puppy had come to live at her forever home, and the Evans family was already deeply attached to their newest member. 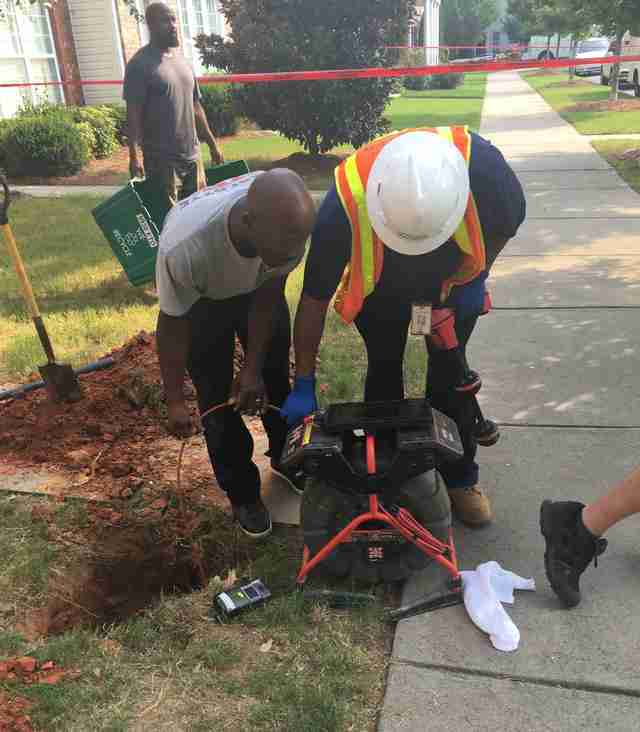 Knowing that time was of the essence, they immediately reported the missing dog, and the Charlotte Fire Department of North Carolina rushed to the scene. Unfortunately, the rescue wasn’t as easy as everyone had hoped. 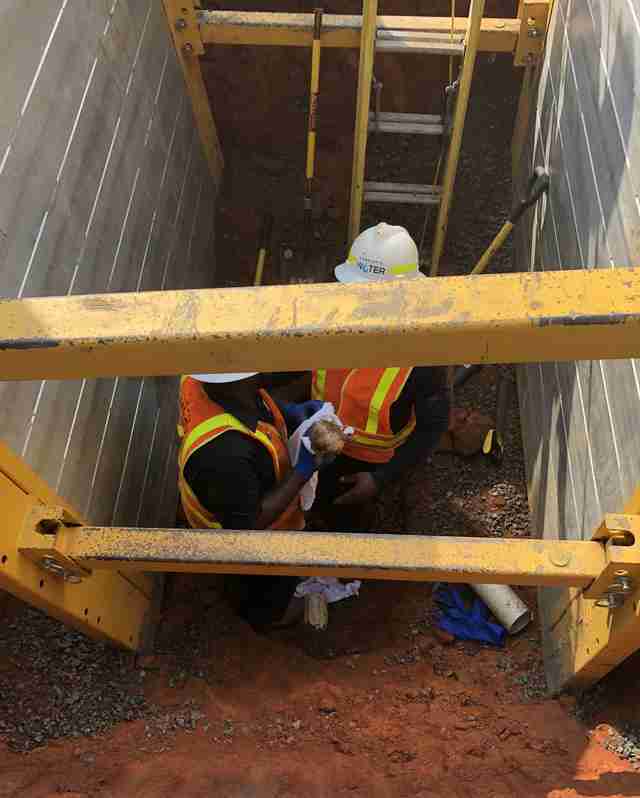 As rush hour traffic started to pile up, the Charlotte water department was called to assist with saving the tiny puppy from deep under the paved road. This wasn’t a simple matter of digging — it was full construction work. To make sure MJ could breathe comfortably, the fire crew began to pump oxygen into the pipe. “We took the same safety precautions you would take when digging a trench or trying to rescue somebody who’s stuck in a hole,” Gilmore said. 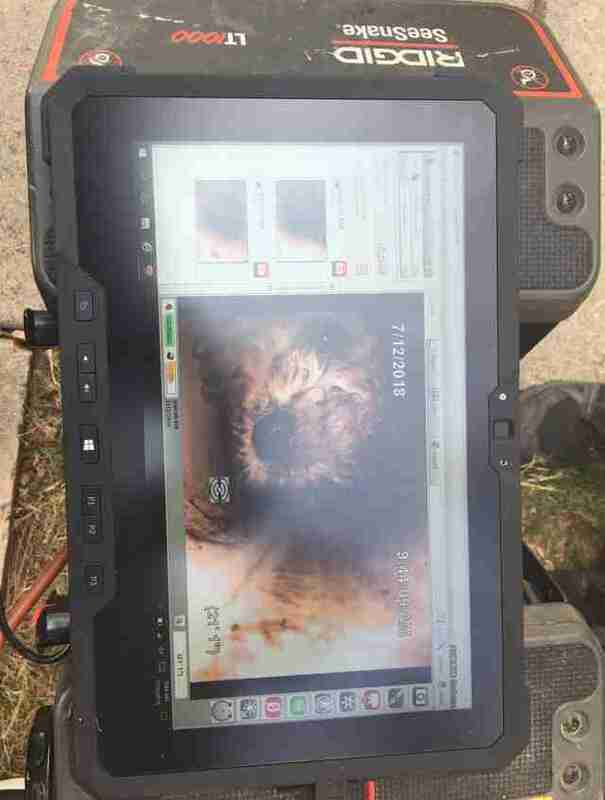 When the water department arrived, they threaded a camera down the hole, trying to pinpoint the puppy’s exact location. While the family was grateful to finally have a visual of MJ, the camera spooked the puppy, causing her to retreat further within the pipe and underground. 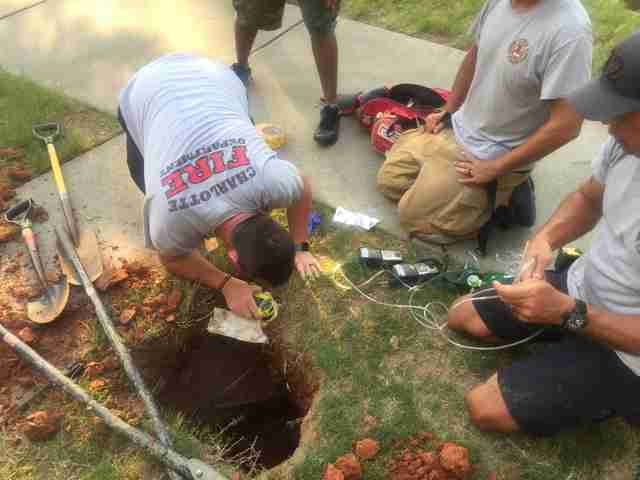 In order to reach the trapped puppy, rescue workers dug an 8-foot trench in the center of the street. 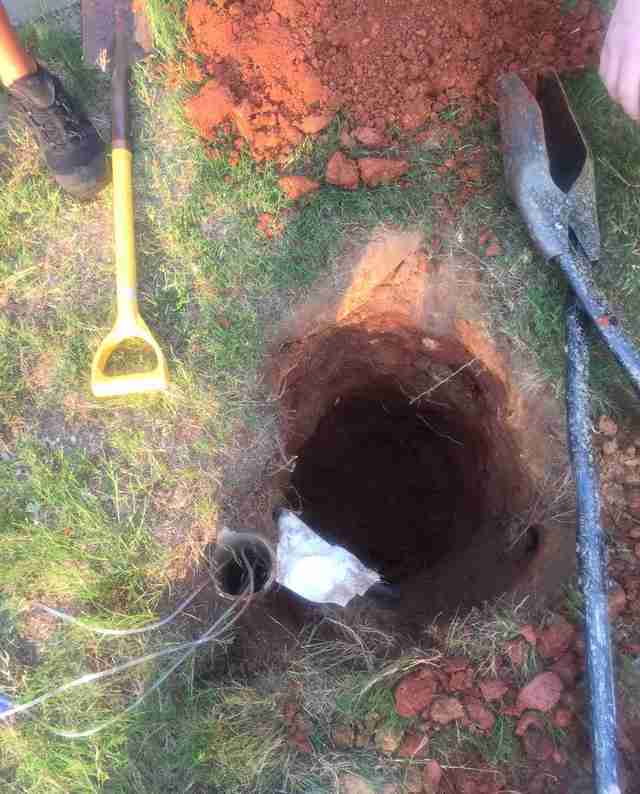 When they finally reached the pipe, cutting a hole was a challenge — one wrong move and the puppy would flee even further into the sewage system. But they were four hours into the rescue operation, and failure was not an option. When a rescue worker finally pulled a dirty, shaking MJ out of the small hole, a cheer erupted from both the workers and the crowd that had gathered. 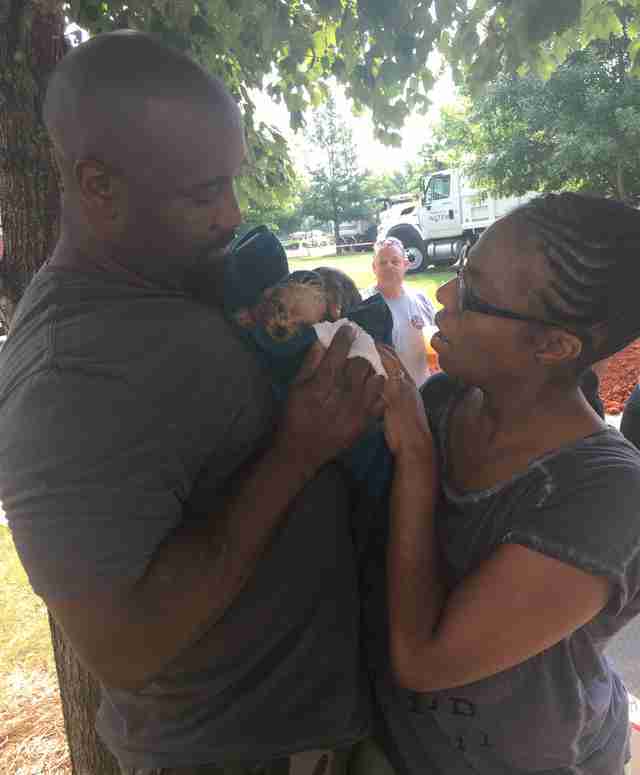 It was an especially emotional reunion for the Evans family, who held MJ close. The puppy was rushed to the vet to be evaluated, and all is looking well for little MJ now. While her introduction to the neighbors was perhaps a little more public than anticipated, it has earned her quite a few new fans.